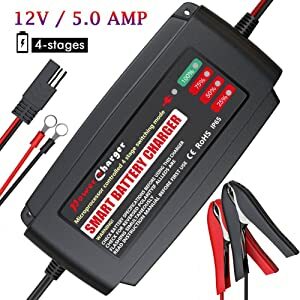 A 12v battery charger is an essential piece of equipment for anyone who regularly rides a motorcycle or off-road vehicle. They’re also great for batteries used occasionally, like for seasonal use or as a back-up battery for an RV. Not all chargers are designed for the same purpose. Some are for jump-starting, some are for refilling the charge, and some are for maintaining a consistent charge. The first choice you have to make when you’re shopping for a charger is exactly what you need it for. We’ve picked out the 10 best 12v battery chargers and reviewed them on the list below. There’s something here that will suit every need and situation. If you’re in the market for a new charger, read on below! You’ll find one that’s a perfect fit. This is an excellent no-frills 12v battery charger. It’s the most affordable smart charger you’ll find, and though it’s not especially powerful, it is both safe and reliable. Let’s start with the basics. 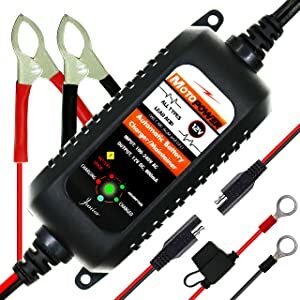 This affordable trickle charger is nothing fancy, but it will charge any 12v SLA or AGM battery. It’s a compact little thing, too, no more than 4 inches on a side. That’s the perfect size to throw in your glovebox, or into your backpack for an off-road adventure. With three highly efficient charging stages, it helps protect your battery and service. Another advantage of simplicity is that it makes it easy to use. You can attach it onto your battery in seconds and removing it is just as easy. If you prefer, you can even safely leave it plugged to the battery full-time in a maintenance application. This isn’t the best charger if you want to charge things quickly. If you want to charge them safely on the cheap, though, you want this Foval automatic charger. 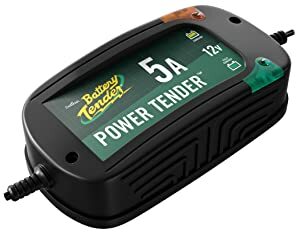 With both 6V and 12V modes, this is a great charger for golf carts, lawn mowers, and other smaller vehicles. The low price and durable construction are also great features. 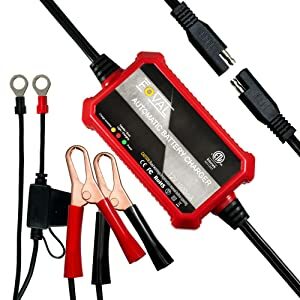 If you’re looking for the most portable 12v battery charger, this LST trickle charger is one of your best options. It’s also one of the least expensive choices here, so budget-minded shoppers will want to give it a look, too. LST Trickle is a good ideal for automotive, ATVs, RVs, scooters, golf carts and so on. While this charger does have a high enough current for a car battery, it really excels for smaller vehicles. Since it has both 6V and 12V modes it works on a lawnmower or golf cart battery without overcharging. Its small size means you can easily use it as a maintainer, as well. Speed is the only real downside of this super-compact 12v battery charger. It just doesn’t have the capacity for a quick charge. For maintaining off-road vehicles, though, it’s a sure bet. This is hands down the best smart charger to use in cold weather. The high power level and option of manual control are other big selling points, especially for those with multiple types of vehicle. The issue some people have with smart chargers is that they don’t give you the option of switching to manual control. If it doesn’t automatically sense the right power levels, you have no way around it. This Ampeak Winter Mode charger, on the other hand, gives you full control along with an automatic mode. 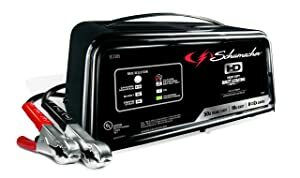 As you might guess from the name, this is the best 12v battery charger to use in extreme weather. It’s designed to give cold batteries enough power without damaging them or lowering their lifespan. Additional protections against over-heating and over-charging make it one of the safest chargers you’ll find, too. 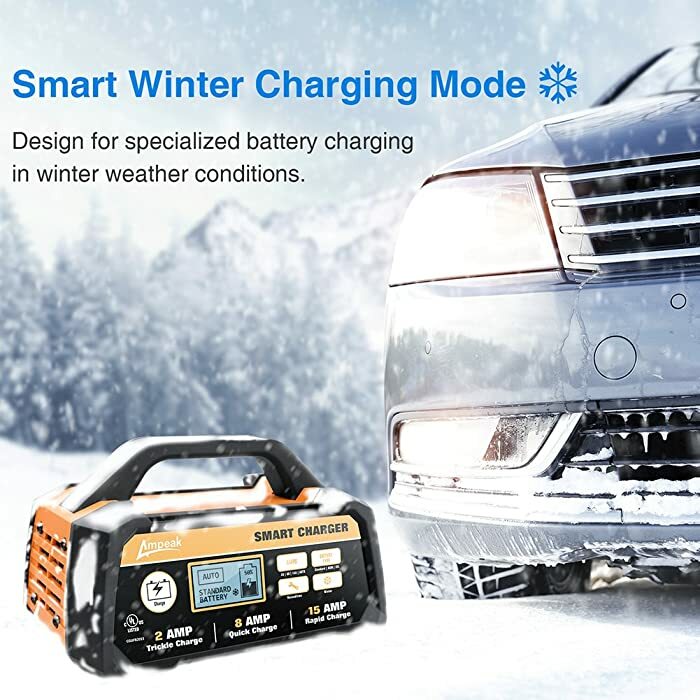 Ampeak is designed for specialized battery charging in winter weather condition. This is on the bigger side, as chargers go, but it’s also a veritable tank. The ABS shell can even protect it from fire, so you definitely don’t need to worry about the heat from an engine. There’s also a storage area on the back for the cables, which makes it more convenient to store. 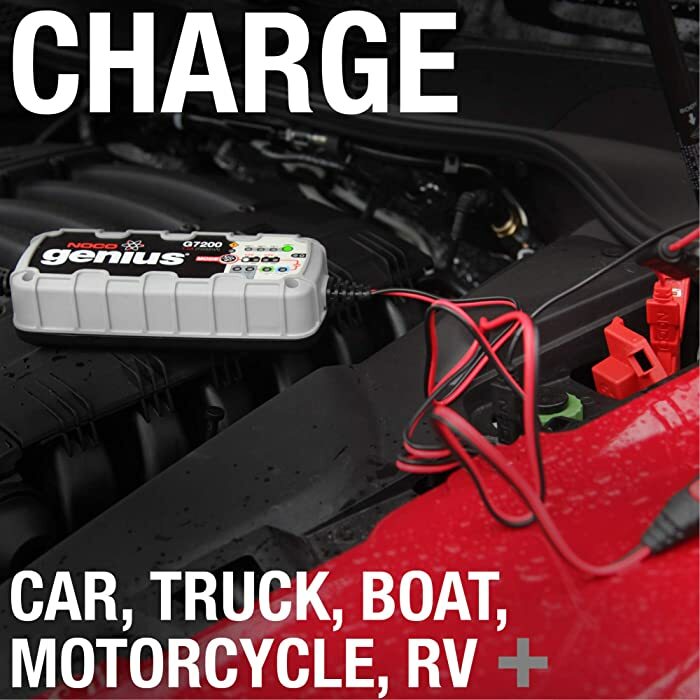 If you’re a boat owner, the waterproof BMK 5-amp charger is your top choice. It’s also portable and versatile enough for cars or ATVs. If you’re charging a boat battery, you need to plan for the possibility that the charger will get wet. That’s what makes this BMK charger such a perfect choice for marine use. The casing is completely waterproof so you can use it worry-free in any environment. This is a relatively compact little charger, too. It only weighs a couple of pounds and it’ll fit in most toolboxes or glove compartments. While you shouldn’t leave it out in the elements full-time, it can handle a lot of different environments without a problem. Ideal for bike, boat, motor, electric cycle, motorcycle, scooter, car, vehicle, automotive. 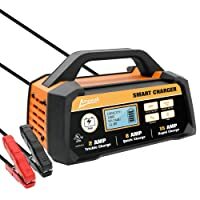 You might expect the waterproofing to jack up the price, but this is honestly a great value for a 5-amp charger. Our only complaint is that the interface doesn’t give you much information. Strictly in terms of performance, though, it’s an excellent option for both land and water vehicles. This versatile charger is a great value at less than twenty bucks. It’s also relatively compact and easy to use, though it does take a while to charge. If your budget has you shopping more in the under twenty bucks price range, you can still get a decent portable charger with this Motopower model. It can be used for both charging and maintenance, too. The inclusion of two connection options makes it even more versatile. We’ll say right off the bat this isn’t the best battery charger for car use. The charging current is less than an amp, so it’ll take a while to get you up and running. It’s a better choice for things like ATVs and motorcycles. In our opinion, its best application is the long-term maintenance of these batteries. With a special function, MOTOPOWER is safe for users. The lower power does have one benefit: it’s physically smaller, too, weighing less than a pound. This portability is another point in its favor for recreational vehicles. If you don’t need a lot of power, you can save yourself some money with this little gem. This compact charger has sophisticated safety protections. It’s an ideal option for top-offs, maintenance, and float charging. 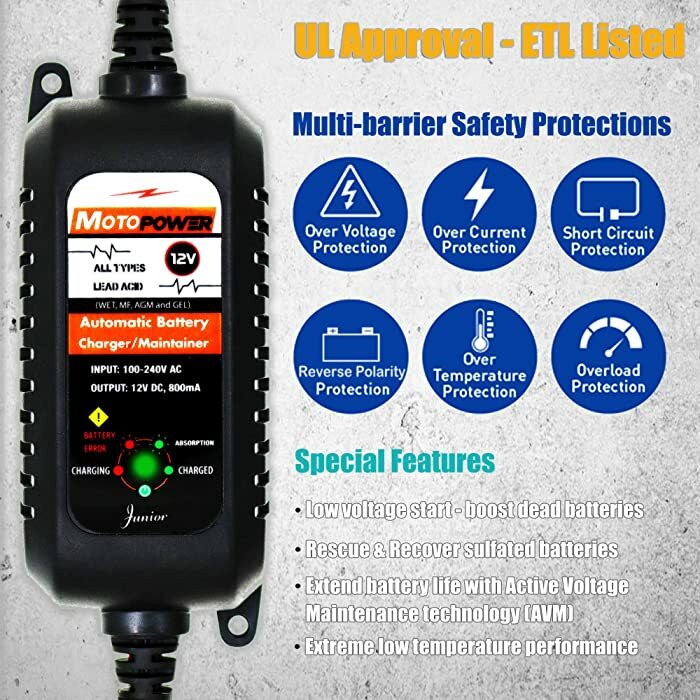 Safety is important in any auto battery charger. It’s especially important if you’re using it to float charge or conduct other long-term maintenance. If that’s your main concern, this Battery Tender model has the most sophisticated safety features of any on the market. Redundancy isn’t normally a good thing, but it is for safety features. It means there are multiple levels of protection in place against power surges, sparking, or overheating. Not only will it shut off if there’s a problem, it won’t even turn on unless you’ve made a good connection. 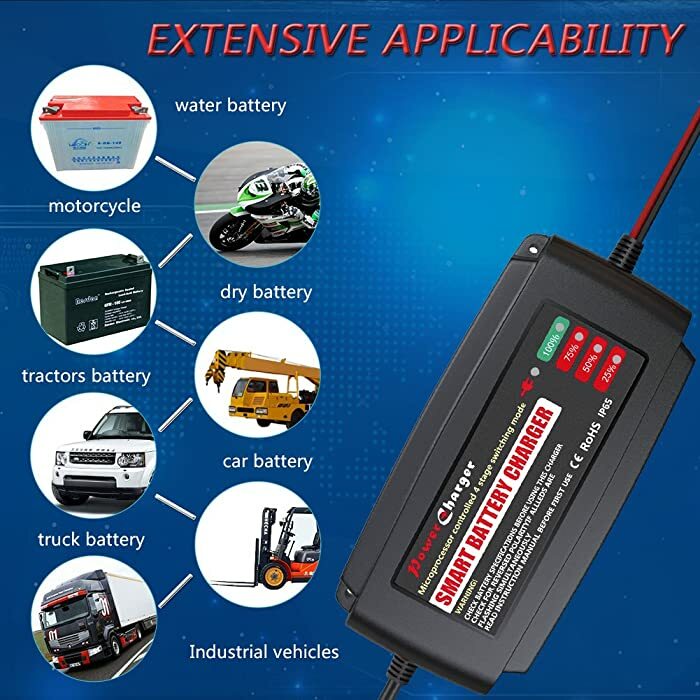 Battery Tender supports many types of transport. This is an especially great option for float charging applications. You can truly plug it in and forget it until you’re ready to use your battery. It might not be the most powerful 12v battery charger, but if you’re looking for reliability it’s a good choice. The compact design of this charger is especially impressive when you see its power. It charges any battery, including both 12V and 24V models, and does it twice as fast as the competition. NOCO is known for packing a lot of power into a small package. The G7200 is the best car battery charger if you have a larger or more powerful engine. With a bigger capacity, it can also charge batteries twice as fast as traditional smart chargers. Every detail of this charger is designed with the user in mind. It’s streamlined and compact, weighing less than five pounds. It’s also rubberized, scratch-proof, and water-resistant. Basically, you can use it wherever, whenever—and count on it to work reliably every time. 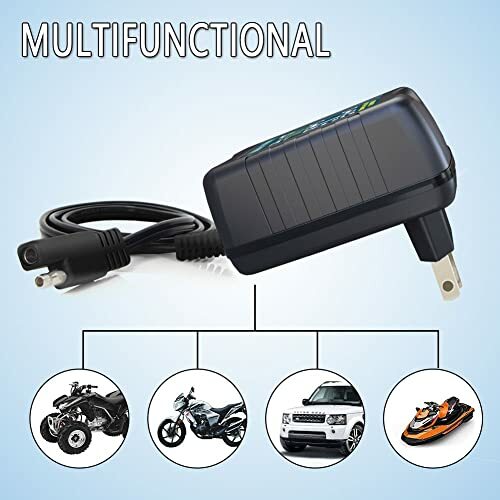 It is a battery charger for cars, truck, boat, motorcycle, and RV. This also might be the smartest charger on the market. The automatic mode selection is accurate and efficient. It has comprehensive diagnostic functions, too, so you can be confident in your battery’s performance. 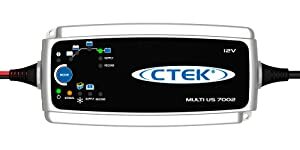 The top of the line in charging technology, this CTEK charger will improve your battery’s performance while it’s charging. Many major luxury auto brands use CTEK chargers in their factories. If you’re curious, this includes high-performance companies like Corvette, Porsche, and Lamborghini. If these chargers are trusted by the makers of these vehicles, you can definitely trust it in yours. The versatility of this charger is probably its biggest selling point. Its four charging modes let you use it for charging or maintenance. It can even recondition and desulphate your battery in Recond Mode, bringing a once-dead battery back to life. 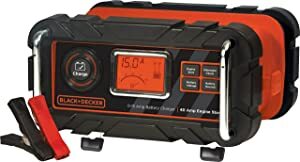 This is a great option if you need a heavy duty battery charger. It’s safe and reliable enough to leave connected to a battery for permanent maintenance. The all-weather performance and multiple charging modes round out its impressive list of features. This bench charger can also function as a jump-starter. The full display screen and automatic mode switching make it very intuitive and user-friendly. Most chargers can’t work as jump starters and vice versa. If you’re looking for something that can do it all, check out the BC15BD from Black+Decker. It’s a powerful, versatile lead acid battery charger that also lets you keep tabs on your battery’s health. A lot of smaller chargers use simple light indicators for the charge status. These can be frustrating for laymen to interpret. On the BC15BD, the LCD display screen solves that problem. You’ll see your battery’s status, the progress of the charge, and other helpful info at a glance. 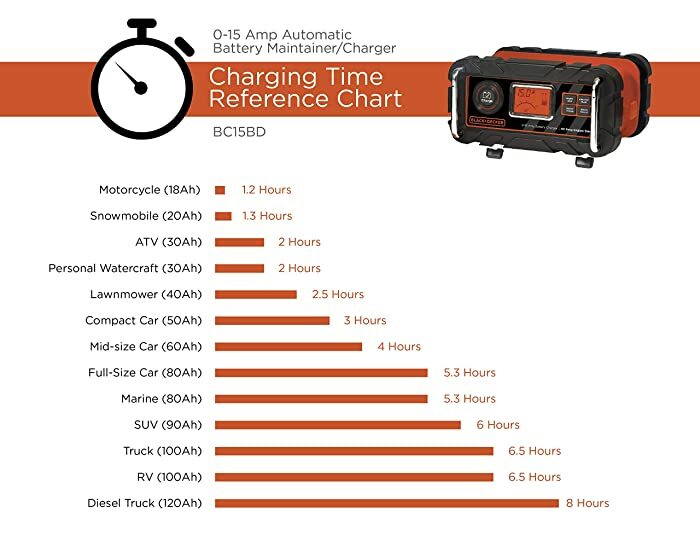 Charging time varies for each type of vehicle. And that ease of use is our favorite thing about this charger. It provides the perfect amount of power to charge a GEL, WET, or AGM battery automatically and safely. The built-in alternator check diagnoses systemic problems, to boot. This unique charger can also be used as a starter. While its larger size makes it better in the garage than on the road, if you’re looking for power it can provide it. In the same vein as the Black+Decker above, this Schumacher can both start and charge batteries. It takes things a step further, though, with added power and performance modes. It’s a convenient option for repair shops as well as your home garage. Even better, built-in protection and monitoring mean you’ll never have to worry about it damaging your battery. Now, this is a bulkier unit, weighing over 10 pounds. It’s not the kind of charger you can leave plugged onto your battery for long-term maintenance. While it will fit nicely into a car’s trunk, I wouldn’t say it’s easily portable. When it comes to performance, however, this Schumacher is impressive in all its modes. The boost function is very helpful for starting batteries that have been completely discharged. This is the best battery charger if you want a powerful all-purpose device. There are merits to all of the chargers on this list—that’s why we included them! 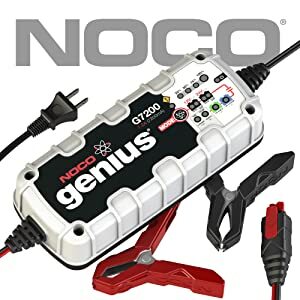 If pressed to pick one as the best, though, we have to say it’s the Noco Genius G7200. Not only is the capacity impressive, the safety features and build quality are top notch. The super-quick charging time is nice, too. The biggest reason to go with a different model would be the price. You likely noticed there’s a significant price difference between the top and bottom entries on this list. If you only need a little power, you can get it cheaper elsewhere. 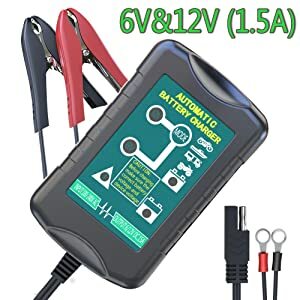 Hopefully, these reviews have helped you figure out the best 12v battery charger for you! Don’t forget to drop us a line in the comments to let us know which one you bought. How long does it take to charge a car battery with a 12v charger? There’s no single answer to this question, unfortunately. It will depend on the size of your battery, how much it’s been discharged, and how powerful your charger is. On average, though, you should expect it to take between 10 and 12 hours to fully charge a deeply-discharged car battery. How many watts does a 12v battery charger use? Again, this depends on the charger. The more power the charger puts out at one time, the more watts it will use. You can usually find this information on the product specification page for the battery you want to buy. 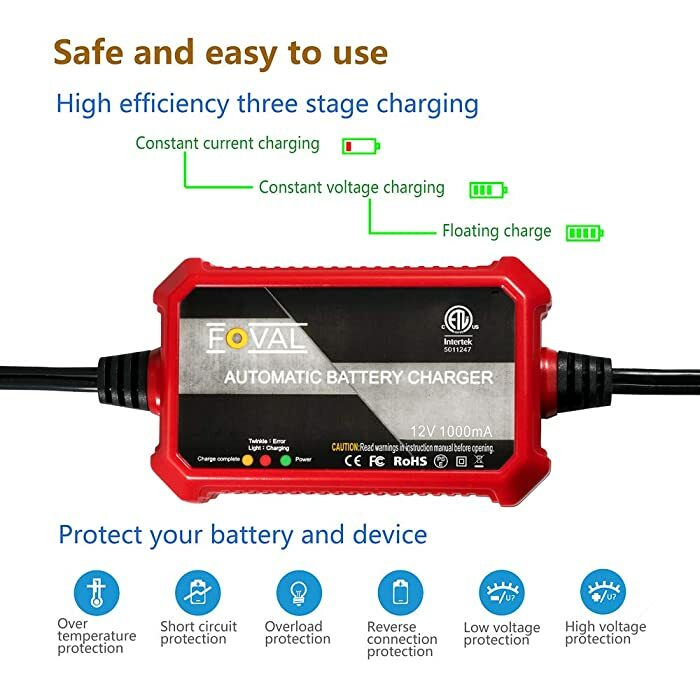 What is the 12v car battery voltage range as it is charging and discharging? When we say something is a 12v battery, that’s an indication of its size, not its actual voltage. Most 12v car batteries measure at around 12.6 volts when they’re fully charged. This will go up if the battery’s in use or if you’re charging it. Most batteries will charge at around 13-14.7 volts.